Mariah Crumbaker, M.D. (Banker) is a Family Practice Physician with a focus on obstetrics and women’s health. Dr. Crumbaker grew up on the Crumbaker hog farm south of Beloit. Her parents are David and Rebecca Crumbaker. As a child she was always interested in biology and medicine. She graduated from Bethany College in Lindsborg, Ks. in 2007 with a Biology degree and then attended the University of Kansas Medical School from 2007-2011. Dr. Crumbaker went to residency at John Peter Smith Hospital in Fort Worth, Tx. She chose this program as it provided 4 years of family medicine training with the last two years having an emphasis on obstetrics and women’s health. She will be joining Beloit Medical Center staff on November 1, 2016. She will bring a broad spectrum of family medicine caring for the young to the elderly encompassing additional skills such as comprehensive obstetrical care, including cesareans, obstetrical ultrasound and a variety of women’s health procedures. For the last year, she has been faculty at her residency while her husband finished his 5th year of residency. 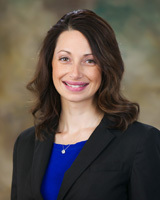 Dr. Mariah Crumbaker is married to Dr. Mark Banker. The two met in medical school and were married after graduating medical school in 2011. They have been living in the Dallas/Fort Worth, Texas area for the last 5 years completing their residency training. Mark and Mariah and their new son, Eli August are all happy to return home and have the privilege of serving the people of north central Kansas.